Upupupu! Sound familiar? For those who missed the Spike Chunsoft game on the Vita back in February, Danganronpa: Trigger Happy Havoc, that should be remedied as soon as possible. I had considered the game my absolute favorite of the year, but Danganronpa 2: Goodbye Despair could very well overtake its predecessor. Danganronpa 2 is everything the first was, but better. Special students chosen to attend Hope’s Peak Academy are once again the focus, but they are no longer confined to the school labyrinth from before. This time, the most talented teenagers in the world find themselves whisked away to a tropical island by a strange, pinky bunny, Monomi, who is somehow tied to the original antagonist of the first game, Monokuma. Except this new, adorable mascot is all about love, and requests the students enjoy their time together during their school field trip. Not much else happens before Monokuma appears and casts them all into the most hellish game of Clue ever played. The sequel does not depart much from the original Danganronpa formula. There are peaceful days, a murder and investigation, shortly followed by a trial. My hesitance to play the second game was out of fear that it would be too far removed from the original’s charm and structure. In reality, all Goodbye Despair does is improve and add to it. Daily tasks on Jabberwock Island revolve around repetitive, predictable elements that are thrown into chaos of confusion and murder after a few nights pass. Chapter 1 can lead you to believe the game is easy enough to figure out, but later twists reveal a tale that is impossible to predict. 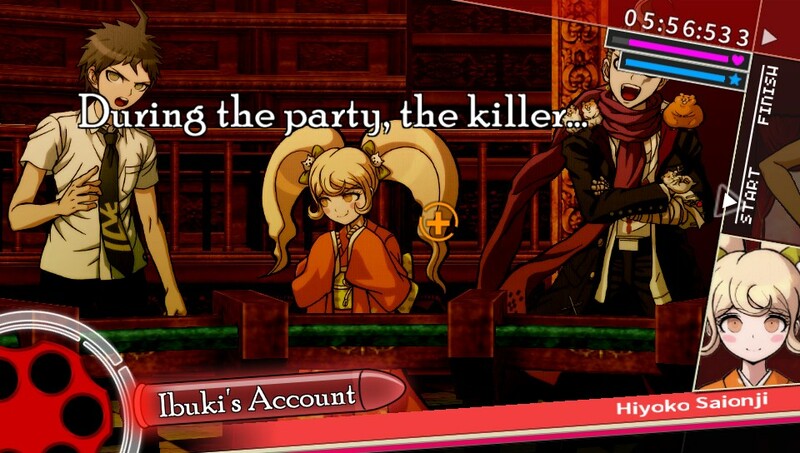 Much of this links back to the previous game, and the full impact of some plot details may not be felt unless Trigger Happy Havoc has been completed before indulging in Goodbye Despair. The option to form bonds with fellow students has also returned. Gifts and frequent chats eventually turn into receiving a hope fragment and a little more information on classmates. These hope fragments can be traded for special skills to assist in the trial mode. Who you choose to invest your time with always feels like a gamble, considering that student could be executed before you finish maxing out the bond. For me, there was a constant internal debate on whether or not I should pursue a relationship with my favorite characters or those who I thought had a chance at living a little longer. But don’t worry too much, there’s always the Island Mode to explore later if your favorite classmate meets an unfortunate fate, which allows players unlimited free time with the entire cast. 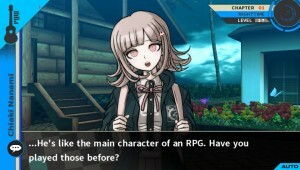 Class Trial mode makes a return in the sequel, which is where the more challenging gameplay exists. This is where Danganronpa 2 significantly improves, as new games have been added and trials do not always follow the same monotonous pattern they did in the first game. 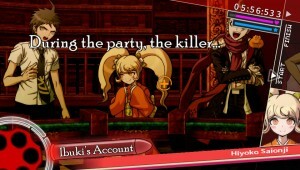 Goodbye Despair’s controls are nothing special. There were moments in some trial mini-games that felt frustrating because of failed attempts to select the correct answer due to the clumsiness of the cursor. This can become an issue if too many attempts are made, since all of the trial games have a time limit. Most trial games kept me on my toes, and the harder difficulties made for even more fun while trying to solve the puzzles. Hangman’s Gambit and the Closing Argument panels were some of my favorites, while my Nonstop Debate experiences were less enjoyable from control mishaps. The sights and sounds of the environment were nothing less than perfect. Execution scenes, however morbid that may sound, stand to be some of my favorite moments in the game. The quirky art style and animation adds something unique to what could be another generic anime scene. Most scenes maintain an odd, cardboard cut-out sort of style, though this changes when it’s time for another student to receive their punishment. Music and voice acting are other areas which the game continues to excel and improve in. Goodbye Despair hosts a wider variety of the same musical stylings of the last game, which is nothing but a plus. 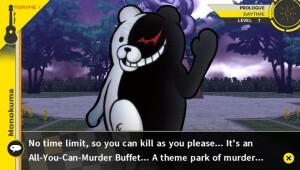 The bizarre moments of Monokuma’s madness are always accompanied by the perfect theme for such a villain, whether he is rambling or punishing another one of his victims. 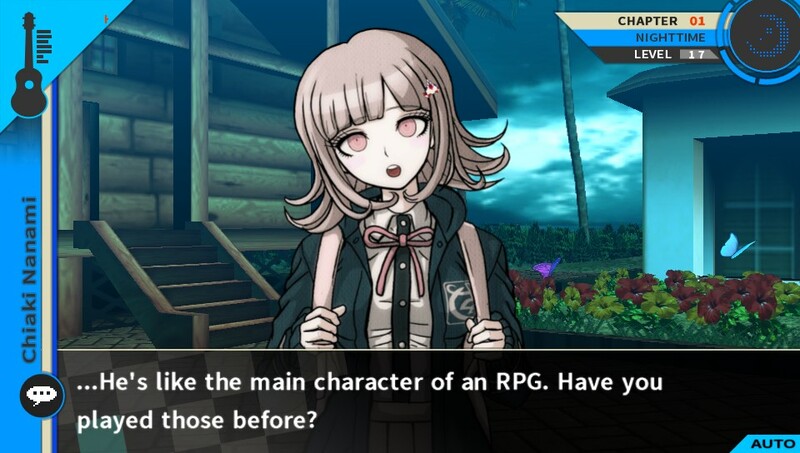 Fans of Japanese games often request the ability to switch between English and Japanese voice tracks, and the Danganronpa 2 still boasts that same feature like the last. The English dub is solid, featuring the work of some industry favorites like Johnny Yong Bosch and Wendee Lee. While the dub is enjoyable, I still maintain that Nobuyo Oyama, the Japanese voice of Monokuma, steals the show and cannot be topped in his performance. Like its predecessor, the meat of Goodbye Despair still lies within the story. A game is perfect when any faults it may have can be completely forgiven in exchange for a more engaging experience using its strengths. And the story is Goodbye Despair’s greatest strength. Danganronpa 2 frequently poses some interesting questions and troubling commentary on humanity, a message in a package that I would not usually expect. The tale of a very sadistic, yet somehow enjoyable villain, torturing high school students with some of the most frustrating mind games I have ever experienced has earned a spot as one of my favorite stories. Excessive fanservice, constant destruction of the fourth wall, and such an outlandish cast may typically be a pass for some. The fanservice, more specifically the scenes with the Ultimate Nurse, are something that I typically find off-putting, along with breaking the fourth wall. However, Monokuma’s story of despair twists and weaves out a series of events that make for some of the greatest storytelling I have experienced in a while. 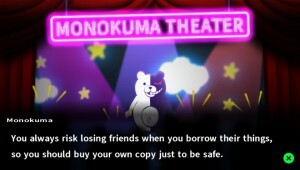 Danganronpa 2 is not your typical RPG or visual novel, no matter how much Monokuma insists on tell us that it is. For Vita owners, Goodbye Despair belongs in your library. As for those who still have yet to pick up Sony’s handheld, the Danganronpa games would be titles that I consider justification for a new console purchase as soon as possible. Danganronpa 2: Goodbye Despair definitely has flaws, but we don’t care. A beary intricate, yet always articulate, story and a more than memorable cast earn this tale of despair a perfect score. Danganronpa 2: Goodbye Despair was developed by Spike Chunsoft and published by NIS America. This title is currently available exclusively for the PlayStation Vita for $39.99. A digital download of the game was provided to Save/Continue by the publisher for review purposes.